BAKERSFIELD, Calif. — Truck drivers are one of the biggest job needs here in Kern County. That's according to the latest jobs number from the Kern Economic Development Center. With more distribution centers moving to the Central Valley, that’s increasing the demand for the drivers. After 25 years behind the wheel as a truck driver, Sepeda traded in his keys for a clipboard to help train the next generation of truckers. As more distribution companies like Amazon, Wal-mart, Dollar General and L'Oréal move into the Central Valley, the greater the demand for truck drivers. Remillard said starting salary for truck drivers is between $45 to $50 thousand dollars a year. And those entry level truck drivers are in growing need as the industry gets older behind the wheel. 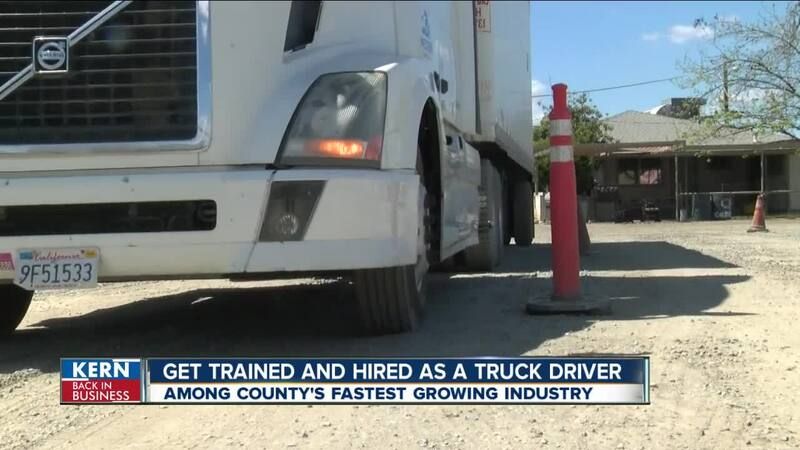 There are a couple of local companies here in Kern County that train drivers willing to shift gears and start a new career as a truck driver. Cindy Remillard said if a driver gets hired out of their school there’s usually a pretty good perk that comes with it. Remillard says western truck school has three training schedules. A four-week day course, six-week night course and an eight-week weekend course. The first part of the course is in the classroom, while most of the training is in the trucks behind the wheel. Western Truck School instructors said experience isn't necessary to start truck driver training. Two current truck driving students are Erick McGhee and Jerry Ochoa. Both of them are leaving Kern County’s top industries, oil and agriculture, for a new career on the road.